The Coolie Loach is a bottom-dwelling fish that enjoys burrowing in sand and exploring hiding places in your tank. Get to know this intriguing freshwater fish with its eel-like shape and fascinating habits. Originating from Southeast Asia, the Coolie Loach is indigenous to the streams of Borneo, Java, western Malaysia, Singapore, Sumatra, and Thailand. Originally described as Cobitis kuhlii, it was later named Acanthophthalmus kuhlii, from the word acanthophthalmus that means "thorn eye," a reference to the spines located beneath the eyes of the Coolie Loach. The current scientific name is Pangio kuhlii, however, many references still utilize the former scientific names. Pangio kuhlii is one of the two dozen species of Kuhlis, a number of which closely resemble each other. Pangio kuhlii sumatranus and Pangio kuhlii myersi are subspecies that have been described based on differences in coloration and markings. P. sumatuanus (also known as the Sumatra Kuhli) has fewer and darker bands than Pangio kuhlii. Sporting even wider bands is Pangio kuhlii myersi. Pangio kuhlii remains the most popular and readily available of the Coolie Loaches. Coolie Loaches have an eel-like body that is yellow to pink in color, with multiple dark brown bands or stripes that partially or fully encircle the body. The body and stripe color patterns vary based on species and/or subspecies. It is not unusual to purchase an incorrectly named loach. However, all Coolies have similar dietary and habitat needs, so knowing the specific species is not critical. The eye of the Coolie is covered by a thin layer of transparent skin and is hidden in one of the dark bands. Below the eyes are a pair of sharp spines that rise if the fish is threatened, making it difficult for a predator to swallow them or for an owner to net them. The mouth of the Coolie Loach points downward and is surrounded by four pairs of barbels. Interestingly enough, the Coolie Loach possesses no lateral line. The fins are small, with the dorsal fin located on the lower third of the body, much closer to the tail than the head. 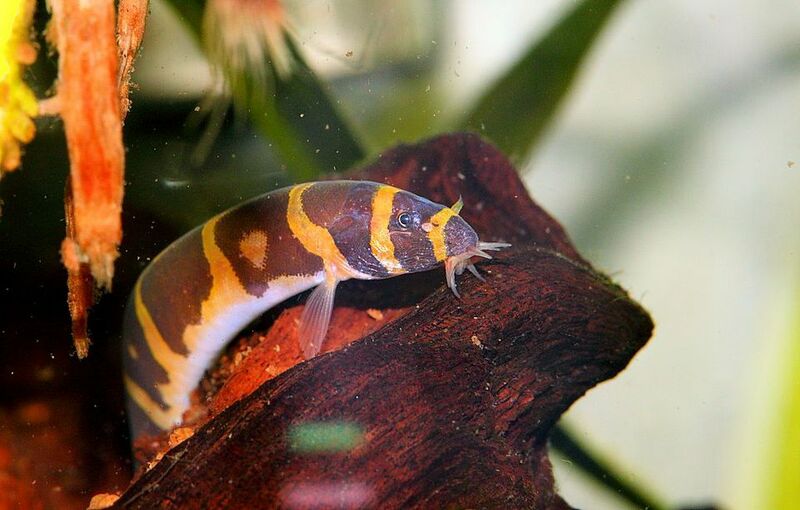 Quick moving, these loaches prefer to remain in the bottom levels of the tank where they rummage for morsels of food. They are social and prefer the company of others of their own kind. The Coolie Loach is most active at twilight and at nighttime, both in nature and in the home aquarium, remaining hidden or buried in the sand during the day. Coolie Loaches are happiest when kept in groups of a half-dozen or more similar species, and they are easily kept with non-aggressive fish. When kept singly they are quite shy and will remain hidden most of the time. Avoid keeping Coolies with large or territorial fish, such as Cichlids; instead choose small fish such as Corydoras, Danios, Rasboras, and Tetras. In nature, the Coolie Loach lives in locations with clear slow-moving waters that has a sandy bottom. They will tolerate a range of water parameters but prefer water on the acidic side and slightly cooler temperatures in the mid-70s. The smooth substrate is a must as these fish love to burrow and can be injured if the substrate has rough edges. Sand is the preferred substrate for these fish, but small smooth gravel will also suffice. Make sure the tank is tightly covered as Coolie Loaches will jump out of the tank, particularly when startled. The inlet tube on the filter should be covered with mesh or a sponge, as there are many documented cases of loaches swimming up the inlet tube and getting trapped in the filter. Owners have reported cases in which Coolie Loaches have disappeared for months, only to be found under the UGF or inside a canister filter, still very much alive. Take a head count on your Coolies to ensure you haven’t lost one! Coolie tanks should have plenty of hiding places, preferably live plants when possible. Rocks, driftwood, and caves are all the excellent decor for Coolie Loaches. Keep lighting subdued, however, a well-lit tank is suitable as long as it is heavily planted, thus offering shady places for the loaches to hide. Place a moonlight in the tank so you can observe them at night because they are nocturnal. Live foods are the preferred diet for Coolie Loaches. However, they will accept a variety of foods, including frozen, freeze-dried, tablets, wafers and flake food. The key is to remember that they need smaller foods that will sink, and you should feed them at night. When it comes to live foods, bloodworms are readily accepted as well as glass worms, tubifex, and daphnia. Frozen versions of these foods are the next best option. Feed live or frozen foods a couple of times per week to augment dry foods. There are no readily discernible differences between Coolie Loaches when they are not breeding. Some have observed that males have larger pectoral fins, with thickening of the second ray. Once females are carrying spawn they become noticeably larger, sometimes to the point of obesity. In some cases, it's possible to see the green colored eggs through the skin of the female. Breeding of Coolie Loaches is challenging, but it has happened in captivity. The breeding tank should have low water levels, very dim lighting, and floating plants, which will be used by the female when laying her eggs. Water pH should be about 6.5, and the water hardness should be lowered. Dense vegetation overall will help promote spawning. The more comfortable the Coolies become with their environment, the greater the chance of spawning. Because Coolies are communal spawners, keeping a larger group will increase the likelihood of spawning occurring. Fish do not reach sexual maturity for two years, which means you may have to be patient if your fish are young when you purchase them. Condition the fish with plenty of live food to encourage spawning. As females near the time to lay their eggs, they will grow very large. Sometimes it is possible to see the green eggs through the skin. When ready to spawn, the female will release bright green adhesive eggs, usually on the underside of the floating plants. To ensure the greatest number of fry survive, remove the adult fish should once the eggs have been laid. Eggs will hatch in approximately 24 hours, and they can number several hundred. Infusoria, generally present in mature live plants, is an ideal first food. Freshly hatched brine shrimp is also a good first food. Commercially prepared fry food or finely crushed flakes are also suitable as fry food.